It’s cold as fall is coming. 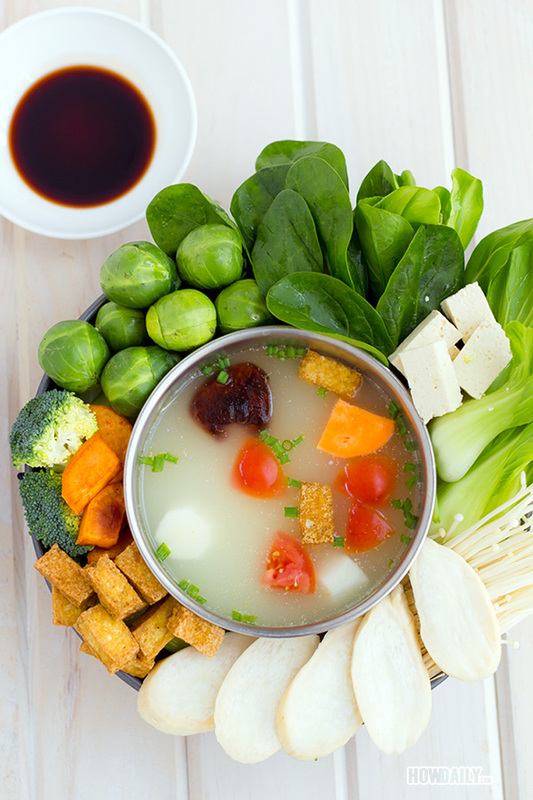 During this season and the next, there’s nothing better to serve as a group/family meal than a hot pot. Imagining it, your whole family is all gathered together, eat, drink and talk…There’s certainly nothing more happy about that. 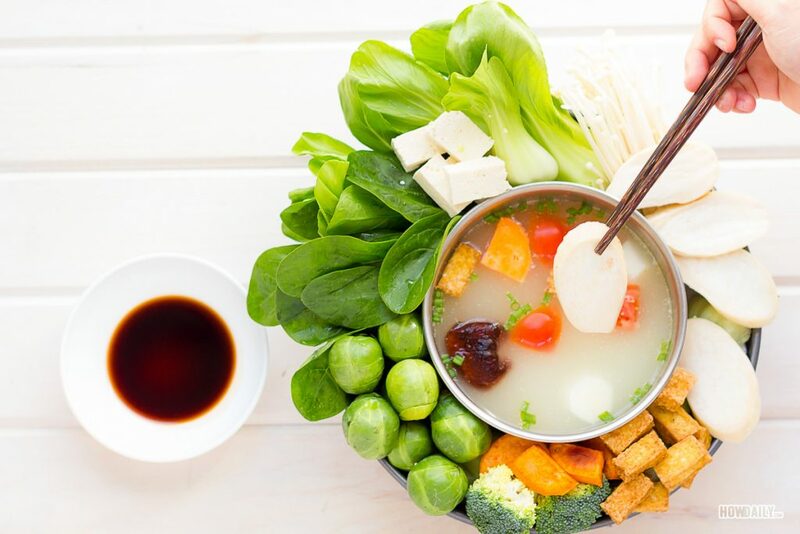 Hotpot, is similar to fondue, a simmering vessel of rich broth and savoring scent surrounded by delicious dip-as-you-eat treats that you can mix and match in your own bowl. Your family/party could share one big pot, or each person could have his/her own personal pot. Even the kid, with some help of course, could dip in too. If you’re looking at the ingredients list and thinking that you don’t have any of these items laying around your kitchen, well, have no fear, as most things are available, fresh and yummy at your local grocery. You could also substitute for anything that on-the-list cause it’s a hot pot, it’s fun, and fully customize-able, the eat at you like thing. The point of a hot pot is, of course, the broth. 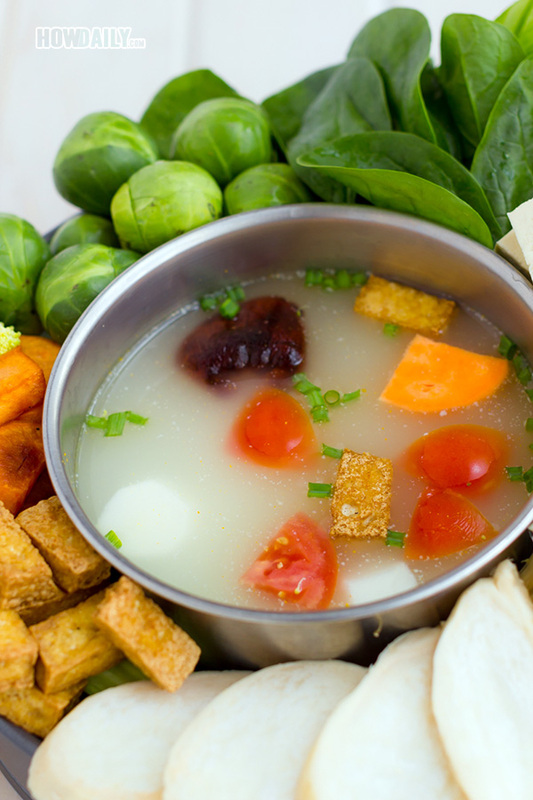 With vegan hot pot, most dipping ingredients are mushroom and fresh veggies/herb. Add in potato, tofu and noodle for fulfillment. So, if you can’t find some thing, feel free to substitute. For example, instead of bok choy and napa, use regular cabbage, lecture or even spinach will do. Celery, bitter melon and leek would work too. If you’re health conscious, skip on frying tofu and yam. Just simple cut and serve them. For the broth, carrot and yukon are there for the original sweetness (instead of the empty calories sugar), plus they taste great too. You can also replace by pumpkin or squash, they’re in season. That being said, this isn’t particularly time consuming or anything, and all of the ingredients can easily be found at Whole Foods. They’re not very expensive, either! Now, even those this is the vegan version, but if you happen to have some meat-eater in the group, than a dish of sliced beef or pork would work for them. In fact, it’s really good to dip those too, in their own pots of course. Remember, you making this to support the vegans !!! Oh and lemongrass, have you ever cooked anything with lemongrass? Well, the Thailand this is a must in every curry dish. It adds a sultry perfume to stews, and it’s really just a fun ingredient to work with. You should be able to find this at the international section those. Fresh lemongrass work best, but dry one work too. My Meijer does carry the, in organic form, so HOORAY!! You only need to use the inner core of the the bulb at the very bottom of each stalk. Peel away the outer leaves until you get to the smooth, cool, core. Cut off a sliver of the bottom, and mince. You’ll probably need 3 stalks for this recipe. Ok, enough of all the chatty, let’s get to the recipe, shall we!! Soak and rinse noodle. Let drain. Wash and thickly slice all mushroom, veggies. Slice tofu and let sit in a basket to dry. Shiratake simply need to be rinsed, but some cellophane and udon may need to be soaked in hot water to soften before adding. Drain when done. 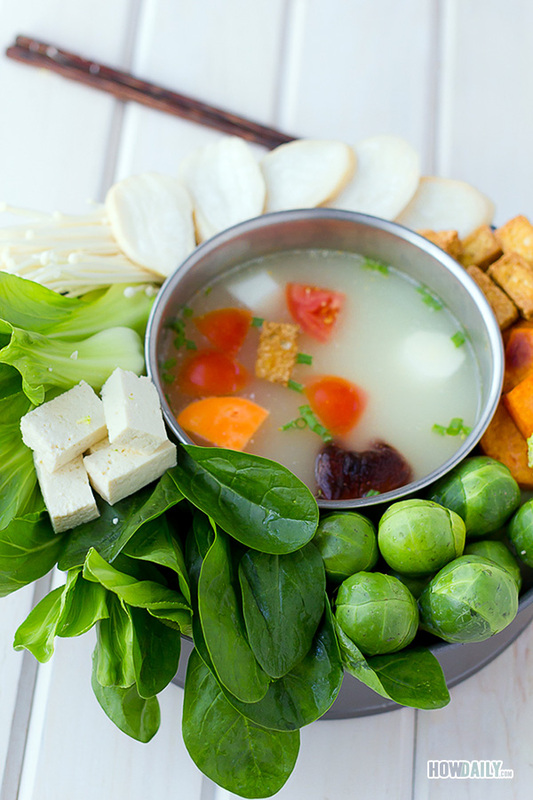 Wash and chop all veggies, yam and tofu. When tofu is dried, deep fry it and let cool at room temperature. Deep fry the yam/potato too and let sit aside. Preheat a 4 quart pot over medium heat. Add carrot, yukon radish to the pot. Mix the cornstarch into the broth and set aside. In a sauce pan at high power, add some oil. When oil is hot (about 1- 2 minutes), add garlic and stir to golden brown. Add tomato, ginger, lemongrass and red bell pepper to the sauce pan, stir to mix. Sprinkle in some salt while stirring, and cook for 2 minutes. Now add the broth/cornstarch into the saute pan. Stir before continue adding star anise, cinnamon and soy sauce. Stir often for the next 10 minutes. When the cornstarch has thickened the broth a bit, pour the whole thing into the boil water pot. be careful as the whole thing is hot and heavy. Now cover pot and bring to a boil again. Add coconut milk and lime juice, and adjust to taste. 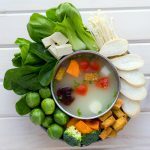 Put the hot soup into a hot pot and serve with other veggies, mushroom, fried tofu, fried yam...each in separate container. When your party is gathered, each person could dip whatever he/she want to eat in the pot and eat when hot. Use soy sauce as condiment or you can make a mixture of crushed peanut and roasted sesame and for dipping.